When I decided to write about the Mafia I knew I would have to rely on the Garden State, where I was born. My current Northwest home is sadly lacking in Sicilian mobsters. I figured my three decades in Area Code 201 would provide plenty of background for my story. Greenfellas is a comic crime novel, with issues. On the day mobster Sal Caetano becomes a grandfather he hears on the news that climate change will make his granddaughter’s world a disaster area. 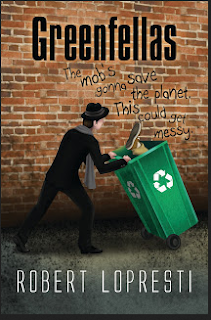 Sal vows to use his mob-honed skills to save the environment. This puts him in conflict with the law, his brother criminals, politicians, and even ecoterrorists. If the world were rational then all the cops working on organized crime in New Jersey would have maps on the wall with nice neat borders. Everything west of here belongs to the Zalzo family. Everything east of this line is D'Agosta territory. The space between? Napolito Land. Certain towns are recognized as monopolies of one gang or another. And some neighborhoods are no-go areas, either because some boss's mother lives there or for reasons long forgotten. Basking Ridge was no-touch because a legendary head of the FBI's New York City office lived there a decade ago. He had long since retired to Florida but, in effect, his ghost still patrolled the town. O.C. units cooperated fully, but they aren't rational either. I enjoyed placing my characters in favorite locales. Some bad guys live in my former house in Morris County (although I owned fewer deadly weapons). If any Hollywood producers are interested, I can show them the exact locale. And I assure them I am entirely willing to sell out. One location I kept deliberately vague. I wanted to set a big picnic in honor of a dead mobster in Echo Lake Park in Mountainside. However, I hadn’t been there for more than a decade and didn’t trust my memory. So I invented Silver Lake Park. No one could argue about thatplace, because it doesn’t exist. One of my first readers lives in New Jersey and she immediately asked: “Why did you change Echo Lake to Silver Lake?” She thought I had described the original down perfectly. Maybe I did. Because, like a Taylor Ham sandwich or salt water taffy, New Jersey tends to stick with you a long time. 1. Tell us about your current novel. have a contract for a non-fiction book. Nothing to do with mystery, unfortunately. I hope you’ll be hearing about it in 2017. 3. What is the greatest pleasure of a writing career? That’s easy. The moment when a story idea pops into your head. First there’s nothing there and then – bang! - There is. It’s obviously magic. 4. What is the greatest DISpleasure? Waiting and waiting and – did I mention waiting? – for an editor’s verdict. That’s actually worse than a rejection. 5. If you have one piece of advice for the publishing world, what is it? I wouldn’t bother. The publishing world has NEVER had the faintest idea of what it was doing. It has always been fighting the last war. As for writers: don’t sign any long term contracts. Don’t get yourself sworn to a current business model, because in five years everything will be different (again). Raymond Paul. He wrote a short series of great historical novels about an Irish Lawyer named Quincannon in pre-Civil War New York. Each was based on a real murder of the time. Does Jack Ritchie qualify as forgotten? One of the greatest authors of comic short mysteries. I have stolen tons from him. “If Carl Hiassen and Al Gore had collaborated on RESERVOIR DOGS, it might have come out something like GREENFELLAS. Then again, it probably wouldn't. Robert Lopresti… has penned a comic crime novel in which a New Jersey mobster with a bad comb-over decides to use his resources to save the environment for future generations. The dialogue is crisp and the situations darkly funny.” - Steve Steinbock, ELLERY QUEEN'S MYSTERY MAGAZINE. “A funny, fast-paced crime story whose serious points pack the wallop of a forty-five.”-Terence Faherty, Shamus-winning author of the Scott Elliott series. "Elizabeth Daly: East Side Stories"
"Pen Pals: Eudora Welty and Ross Macdonald,"
Did I miss the link of 'where to buy?' Well done. Sounds like it's right up my alley. Being a Jersey girl, this sounds like the kind of novel I would enjoy reading. I love comic mysteries and am a fan of Janet Evanovich. Rob, I'm certain I will love your new book as well. Congrats. soon on tv? remember those george gilman "edge"
PAPERBACK PARADE #89 New Issue Out!